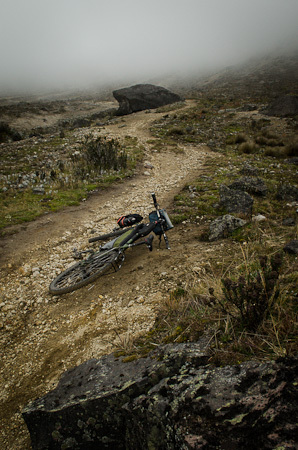 Biking up Volcán Pichincha, Ecuador. 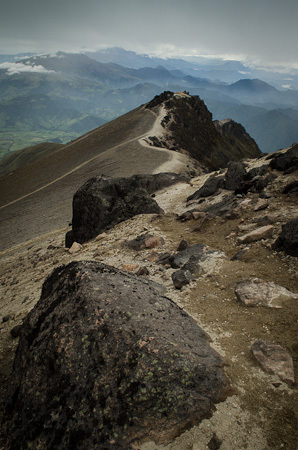 With Ecuador famed for its Avenue of Volcanoes – as coined by German explorer Alexander von Humboldt back in the 19th century – I took the opportunity to stretch out my legs by tackling the climb up to Volcán Pichincha, whose crater rim lies at a lofty 4780m. Rising up like a jagged crown to the west of the capital, it’s very much an active volcano: the last major eruption was in 1999, smothering the city with a thick layer of ash, darkening the sky and grounding air traffic to a halt. 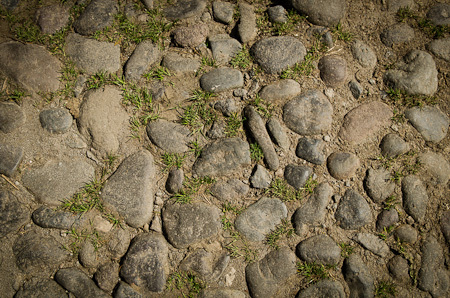 From Tumbaco (2250m), I headed up to Quito (2850m) via the cobblestoned Avenue de las Conquistadores, crossing the city and hurdling another pass to the small settlement of Lloa. 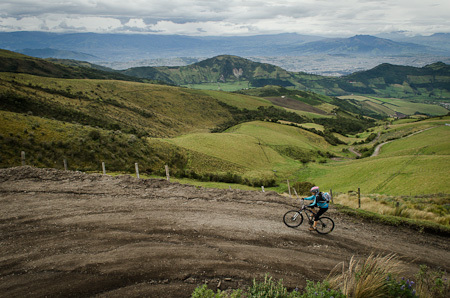 I left late, so broke the ride up with a night in a hacienda there – a dairy farm – run by mountain biking enthusiast Gabrielle. Then began the hard graft in earnest: a gain of some 1450m over just 14kms in distance, following a dirt road that wound its way up to a mountain refugio at 4550m. 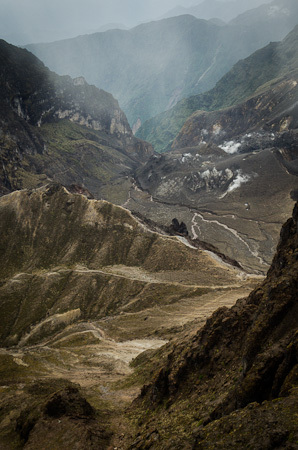 From there, a short section of singletrack lead me to the crater’s edge, peering down into a steamy cauldron of bubbling sulphur. 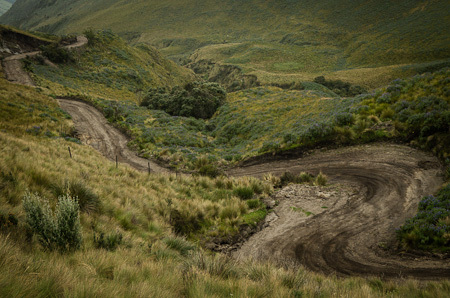 With a crack-of-dawn start, you could tackle the whole ride in a day – but it would be a long one. 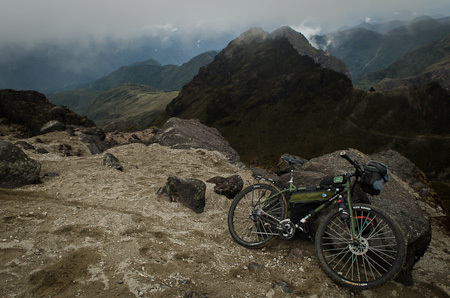 If you’re well acclimatised, it would be cool to stay at the refugio. 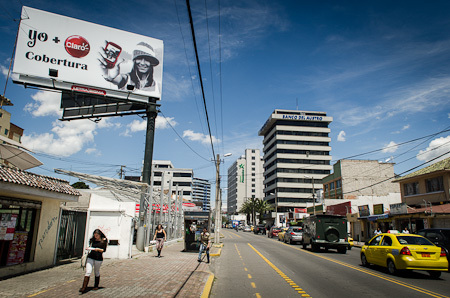 Quito is more bike-friendly than you might expect, with several bike paths crossing the city, as well as the weekly Ciclovia, when much of the centre is closed to motorised traffic. 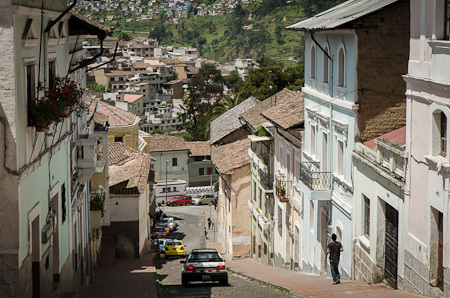 The route I took wended its way through the historic part of town, where steep, cobblestoned streets are the order of the day. I’d paired down my belongings to what I needed for the night – a sleeping bag, Thermarest, extra layers and food. 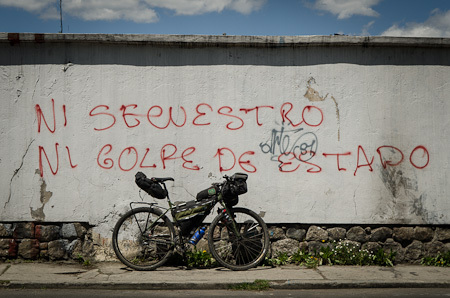 This grafitti reads: no hostage taking, no coup d’état. Refuel. 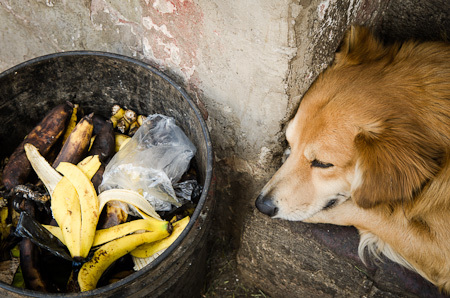 At a few cents a banana (Ecuador was dollarized in 2000), they’re almost giving them away. 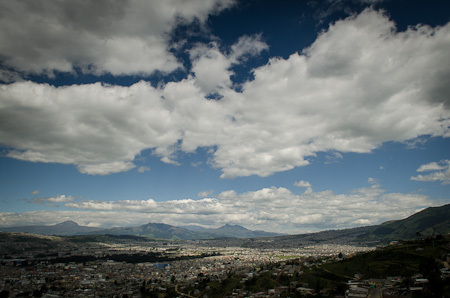 As I climbed up towards Lloa, the full extent of the city sprawl could be seen – Quito extends some 48kms in length. This time I came prepared. 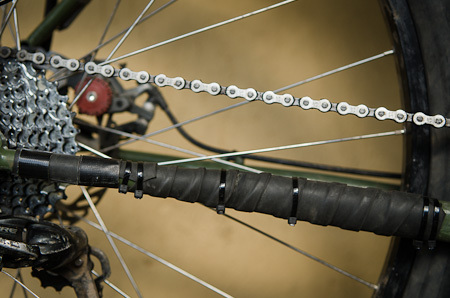 I wrapped Ogre’s chainstay with an old inner tube to muffle the clatter and rattle of the chain. 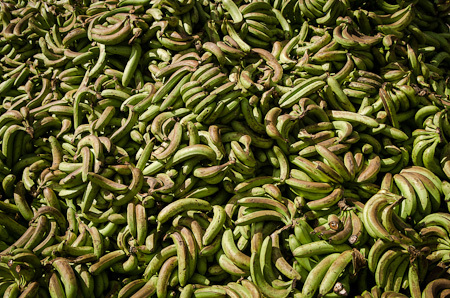 I was tempted to help myself to this mini mountain of bananas, cow food at the dairy farm I stayed in for the night. Gabrielle kept me company for the afternoon, exchanging travel stories – as well as being a keen mountain biker, he’s bike toured from Honduras to Ecuador. Then he left to go home in Quito, claiming it was too cold for him up at the hacienda, so I rolled out my mat, put on the TV and watched the Simpsons in Spanish. 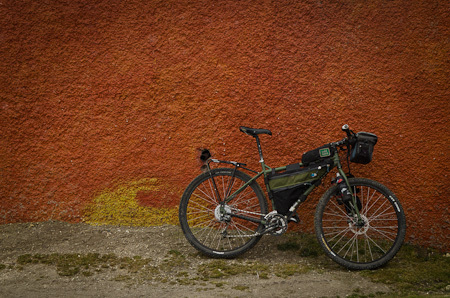 In the morning, Gabrielle returned with his daighter, Allesandra, also a mountain biker. We rode the first few kilometres together, before the altitude forced her back. She’d been working for the last few weeks by the coast, so hadn’t had a chance to acclimatise. I pushed on up the dirt road, which corkscrewed its way every higher. 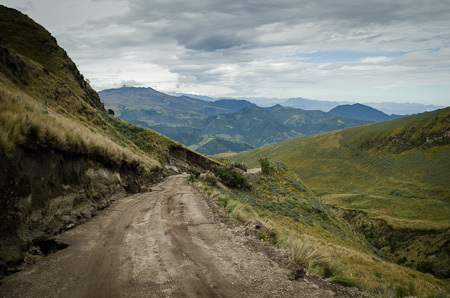 The grades were steep in places, then eased up with more gentle switchbacks. 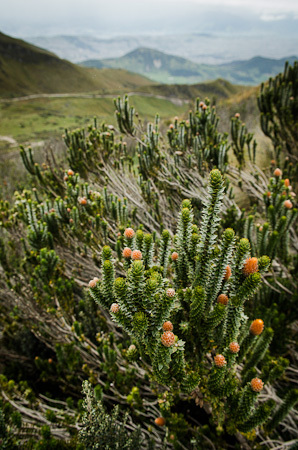 Welcome to the Ecuadorian páramo, the ecosystem squeezed between the continuous timberline and the permanent snowline in the northern Andes of South America. 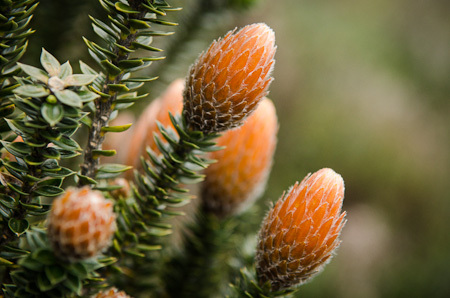 Chuquiragua – the flower of the Andes – up at 4200m. Ogre at the Refugio. I jettisoned the rest of my belongings at the hacienda in Lloa. Me being me, I figured I’d struggle on up the singletrack that links the refugio to the crater’s edge, rather than hike up, as most sensible people do. 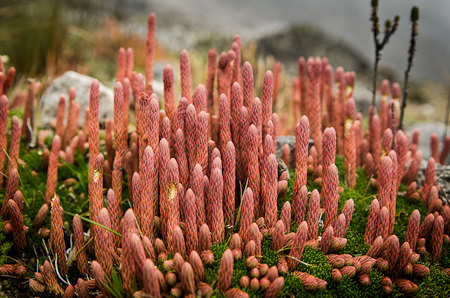 I have yet to find out the name of these bizarre, finger-like plants that probed this humid, high altitude landscape. UPDATE: I am informed, by the venerable Simon Giles, that they are a sub-genii of the Huperzia Crassa… or Club Mosses in colloquial English. They came in several tones. 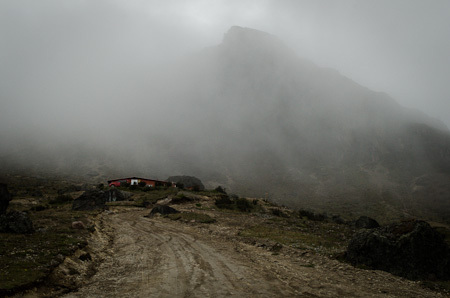 By the time I’d made it up, clouds were hurtling by overhead, so I huddled behind a rock. out of the wind. Before long, there was nothing but a thick bank of swirling mist to be seen. Looking down into the crater. Plumes of steam came belching out of its belly and the smell of sulphur wafted through the air. You can see the singletrack I rode to the left. Heading back down the volcano was a blast. The disc rotors on my bike pinged and hissed as rain began to fall. 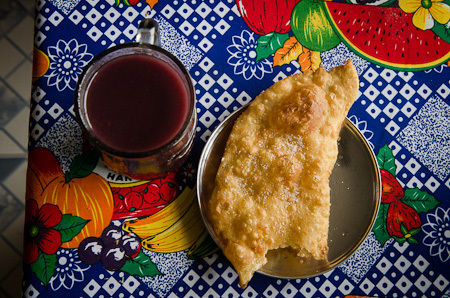 In Lloa, I refueld on a warming glass of colada morada, a warm, thick drink made from forest fruits, typically prepared on the Day of the Dead. It helped wash down a donut-like empanada de viento. Viento means wind in Spanish, and it’s no named because of the way it exhales with air when you first take a bite. 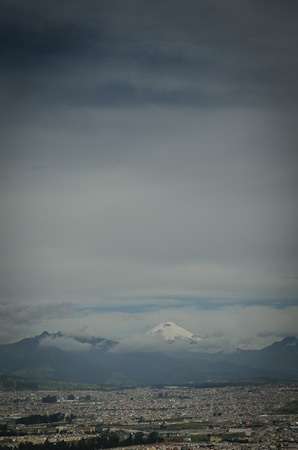 Retracing my steps back through the city, with a view of 5897m Cotopaxi in the distance. 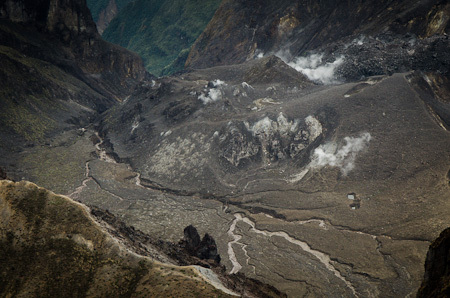 This entry was posted in Ecuador and tagged Ecuador, volcan pichincha on May 28, 2012 by Cass Gilbert. I’m digging your blog. Great images and well written stories…What’s NOT to dig! Looks like an awesome couple of days! 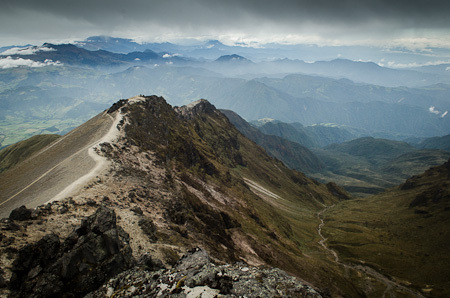 Bet you were glad you perserverd on the top: looks like a view worth waiting for! So excited to be following your continued journey! What are you shooting photos with now? The DSLR or mirrorless? Thanks for the comments, it was a great ride. I’ve gone back to the DSLR for now. I kind of regret it already in that it’s so heavy – mainly due to the 17-55 2.8 lens. I made the choice as I really missed not having a lens wider than 28 equivalent. However, I see Panasonic have a new 12-35 2.8 (24-70) that’s only 300g, and weather sealed. From the initial reviews, it seems like a great lens. That would make perhaps the ideal combination for what I like to do… if I had a spare $1000+! I really can’t see much difference in quality between the two systems – it’s more to do with the lenses that you have, I think. 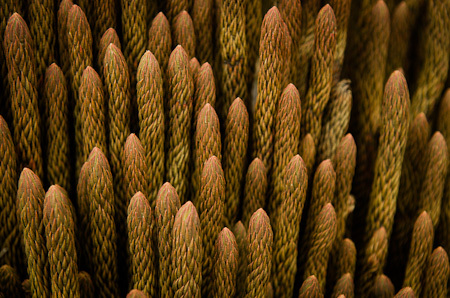 Two different sub-genii of the Huperzia Crassa…Club Mosses in the colloquial english…(he pushes his horn rimmed glasses to the bridge of his nose with a bony finger!). Thanks for the great pics…so glad you are back on the road…4.5k …a mere bagatelle for you. One week countdown for number two starts on Friday! Thinking of you here. Brilliant. I was hoping you’d chime in mr G.
Did you get up to the volcanic lake on Cotacachi? a nice ride if I remember and not too far from the pueblito below. Thankyou for sharing such a marvellous adventure, I am eagerly anticipating your next instalment! How come you’re running derailleurs now? Are you using the GPS? If so were you able to find free maps for the area? A friend has talked me into using my unit for the Divide. He even gave me an SD card with all the topos on it and it includes water sources. I’ll load Scott’s GPX file tonight. Are lithium AA batteries available there? Fabulous photos! Part of me feels as though I should be with you. Okay, a few more. Not found maps so far, no Ecuador ones on GPS File Depot. I’ve looked in a couple of shops for Lithiums. No luck yet, but I’m sure they’re about. There’s a lot of high end stuff here. Here are some goods links for Brasil. Great, thank you, will check them out. Oh my goodness, your adventures just get more fun to read and pictures more interesting to look at. always a great few minute break for a desk-bound admirer of your lifestyle. Are you still using your spot communicator? Hi Talbot. Yes, still got the faithful Spot. I don’t activate it every day, more as an emergency – good for my mum’s peace of mind! Thanks Neil. I shall be consulting your most excellent website in great detail! 11 minutes back down :)…..or was that Illalo? Damn Cass. Way to go get’em pedaling that ridge-y singletrack woozy and lightheaded. Thanks for adding yet another spot to my bucket list.